So you got your resume noticed and you got what you have been hoping for, a call from the company that you applied for a job at and they want to set up an interview! This is amazing, you are super excited and a bundle of nerves but with a few tiny tips (that make a huge difference), you can improve your chances of landing that job you've been wishing for! FACT: It takes about seven to seventeen seconds to make a first impression. Think about that. You want your one first impression to be your best. So here are a few things that you can do and keep in mind to achieve that great first impression. -Dress the part- Dress professionally and modest aka no jeans or boobies hanging out. Of course all jobs are different, but you want to look professional and look cleaned up. You want the interviewer to know that you are taking this interview seriously and as mentioned before, your first seven seconds are important! -Make eye contact and smile- Smiling makes you look approachable and friendly while keeping eye contact lets the interviewer know that you are paying attention and are focused on the meeting at hand. -Shake hands-This is how you develop a level of rapport. Also many judge people by the grip and strength of their handshake, so be sure to shake hands in a firmly and confident manner. -Do not chew gum! This is a big no no. Just don't do it! I actually know of bosses and CEOs who did not even proceed with the interview because the person who was suppose to be getting interviewed was chewing gum. Don't loose out on a big opportunity because of gum. -Posture- It is crazy how much people read body language even when they don't realize that they are doing it. Be sure to sit up straight and ever so slightly lean in towards the person interviewing you to show your interest and that you are paying attention. Do not fidget around clicking pens and shuffling papers. Simply fold your hands on your lap and focus on your interview. -Be prepared- Research the company and clearly understand what they are about and what they are looking for. Bring a copy of your resume and/or papers that you need to help you get your point across. -Be Thankful- No matter how you think your interview went, thank the person that you met with for their time and remember that firm handshake. Also, do not forget to send a letter of thanks a few days after your meeting. Now you are set and ready to go get that job! Be confident, you know what you are doing, you know how to make a good first impression, get it get it, deep breath and good luck! 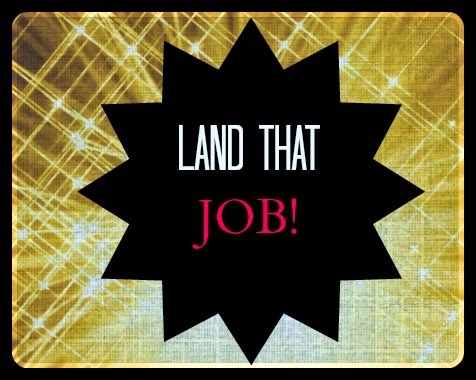 What are your tips for landing that job that you wanted? Great tips! I think my tip is be positive. Don't say anything negative of past or present employers. You don't want to come off bitter or a less than hard worker. That is def a great tip! No one wants to hire someone who is negative, and if your potential employeer hears you talking negatvie about past employers, they know that you could just as easily talk negativley about them.